-Save 50% on an 8.5x11 Classic Calendar with code CLASSCAL. Ends 11/2/13. -Get 50 4x6 prints for just $6 CVSphoto.com. Use code PRINTSMILE at checkout. Ends 11/2/13. -Canvas Prints are now 25% Off at CVSphoto.com. Use code CANVASPRINT. -Save 30% on Mugs, Mouse Pads and Phone Cases at CVSphoto.com. Use code CVS30. Ends 11/2/13. -10 Cent 4x6 Prints when you order 75+. Coupon Code: 10CENT75. Ends 11/2/13. -33% off Photo Gifts. Coupon Code: 33OFFGIFT. Ends 11/2/13. -25% off Photo Cards. Coupon Code: PHOTOCARD. Ends 11/2/13. New ibotta offers & Store Extras! Ibotta has some new offers available! Here is what they added plus any coupons you can stck for additional savings! Not familiar with Ibotta? It is a FREE app for your compatible iPhone, iPod, iPad, or Android device that gives you cash back for purchasing featured products each week. 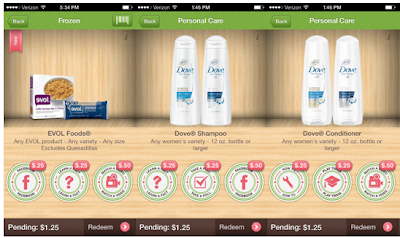 You just load the offers in your account, purchase the product(s), upload your receipt and scan the barcode! Super easy way to earn cash back! You can download it HERE. Check the app for a $1 Bonus on EVOL Foods which is in addition to the earnings on each of the EVOL Ibotta Offers mentioned above. Follow the rules on the Bonus and redeem both the 1) $1 EVOL offer in the Ibotta Product Gallery and 2) the $1 EVOL Target Store Extra at Target for a total of $3! Today only get a 50-Quart Storage Box, Set of 8 for only $37.00 (Retail $43.76). These are great to store last seasons clothes, holiday decorations & so much more.